The 2008 UAW-Dodge 400 was the third stock car race of the 2008 NASCAR Sprint Cup Series. It was held on March 2, 2008, before a crowd of 153,000 in Las Vegas, Nevada, at Las Vegas Motor Speedway, one of ten intermediate tracks to hold NASCAR races. The 267-lap race was won by Carl Edwards of the Roush Fenway Racing team who started from second position. Dale Earnhardt Jr. finished second and Edwards' teammate Greg Biffle came in third. Kyle Busch won the pole position, which he held for 20 laps until he was passed by Edwards. He held the lead until the first green-flag pit stops and regained the position after the stops ended. Busch retook the lead on lap 81 and held it until he was passed by Matt Kenseth. Jeff Gordon took over the lead on lap 163, before Earnhardt became the leader on the 181st lap and maintained this position until Edwards regained it 14 laps later. The race was stopped for 17 minutes when Gordon crashed on lap 262, and car parts were strewn into the path of other drivers, requiring officials to clean the track. Edwards maintained the lead at the restart and held it to win the race. There were eleven cautions and 19 lead changes by nine different drivers during the race. The race was Edwards' second consecutive win of the season, and the ninth of his career. Edwards was later issued with a 100-point penalty after his car was found to violate NASCAR regulations, dropping him from first to seventh in the Drivers' Championship. Kyle Busch increased his lead over Ryan Newman to 20 points as a consequence. Ford took over the lead of the Manufacturers' Championship, five points ahead of Dodge. Chevrolet moved clear of Toyota in third place, with 33 races left in the season. The race attracted 12.1 million television viewers. The UAW-Dodge 400 was the third out of 36 scheduled stock car races of the 2008 NASCAR Sprint Cup Series. It was held on March 2, 2008, in Las Vegas, Nevada, at Las Vegas Motor Speedway, one of ten intermediate tracks to hold NASCAR races; the others are Atlanta Motor Speedway, Charlotte Motor Speedway, Chicagoland Speedway, Darlington Raceway, Homestead-Miami Speedway, Kansas Speedway, Kentucky Speedway, New Hampshire Motor Speedway, and Texas Motor Speedway. The standard track at Las Vegas Motor Speedway is a four-turn 1.5-mile (2.4 km) oval. Its turns are banked at twenty degrees and both the front stretch (the location of the finish line) and the back stretch are banked at nine degrees. Before the race, Kyle Busch led the Drivers' Championship with 335 points, ahead of Ryan Newman in second and Tony Stewart third. Kurt Busch and Carl Edwards were fourth and fifth, and Kasey Kahne, Kevin Harvick, Jimmie Johnson, Greg Biffle, Jeff Burton, Brian Vickers and Martin Truex Jr. rounded out the top twelve. In the Manufacturers' Championship, Dodge and Ford were tied for the lead with twelve points each; their rivals Chevrolet and Toyota were tied for third place with ten points each. Johnson was the race's defending champion. In preparation for the race, NASCAR held the second of its two pre-season tests for Sprint Cup entrants on January 28–29 at Las Vegas Motor Speedway. Sessions began at 9:00 a.m. Eastern Standard Time (EST), paused from 12:00 to 1:00 p.m., and concluded at 5:00 p.m. Sixty-seven cars participated in the January 28 morning session; Denny Hamlin was quickest with a top speed of 178.265 miles per hour (286.890 km/h), while Kyle Busch was quickest in the afternoon session, with a top speed of 183.350 miles per hour (295.073 km/h). Several incidents occurred during the second session; Regan Smith spun leaving turn-two and damaged his car's nose after hitting the inside wall; Sam Hornish Jr. heavily damaged his car after scraping the wall hard; and Dario Franchitti heavily damaged his Dodge's rear after spinning. Jacques Villeneuve spun but did not damage his car; David Ragan wrecked after spinning off turn-two; and Mark Martin damaged the front of his vehicle when he hit a cement piling after swerving to avoid a tow truck. During the third session with seventy-four cars, Edwards had the fastest speed of 184.256 miles per hour (296.531 km/h), and Burton damaged the right-hand side of his car after hitting the wall. Juan Pablo Montoya recorded the fastest speed of the two days, at 186.761 miles per hour (300.563 km/h) in the fourth and final session. Edwards was looking forward to the race weekend and felt that his result would be good. Biffle was confident he could secure a top-five finishing position, and stated if his car's handling was good, he believed he could be in contention for winning the race. Having won twice at the track in the early 2000s, Kenseth stated that he enjoyed racing at Las Vegas Motor Speedway and hoped the Roush Fenway Racing cars would be able to contend for race victories. Johnson was considered by some bookmakers as the favorite to win the race, and in the event he succeeded, he would have become the first person to secure four consecutive victories in a NASCAR Cup Series racing event since Gordon won the Southern 500 four times between 1995 and 1998. He said that it would be "great" if he took the victory but would not approach the event differently than at a track where he had not won a race. There was one change of driver before the race. Jon Wood, the grandson of retired driver Glen Wood, was originally scheduled to replace 1988 NASCAR Winston Cup Series champion Bill Elliott in the No. 21 Wood Brothers Racing car, but withdrew because of a lack of experience with the Car of Tomorrow, and former Haas CNC Racing driver Johnny Sauter took over his seat. Wood said he felt Sauter was a better qualifier and Elliott was not available to drive. Kahne developed a sinus infection two days before the event, and his team had Nationwide Series driver Jason Keller ready to replace him if he could not compete. Kyle Busch had the third pole position of his career. Three practice sessions were held before the Sunday race, one on Friday and two on Saturday. The first session lasted 90 minutes, the second 45 minutes and the third 60 minutes. In the first practice session, Kyle Busch was fastest with a time of 30.009 seconds; Jeff Gordon was second and Johnson third. Stewart took fourth, and David Reutimann was placed fifth. Dale Earnhardt Jr., Edwards, Elliott Sadler, Kurt Busch, and Jeremy Mayfield rounded out the session's top ten fastest drivers. Hornish made contact with the turn-two barrier, while Reed Sorenson and Patrick Carpentier spun in turn-four but avoided damaging their cars. Montoya switched to a back-up car after heavily colliding with the turn-two wall, and Bobby Labonte did the same after he lost control in turn-four and damaged his left-rear quarter. Kahne made light contact with the turn-four wall, repaired by his team. Although 47 drivers were entered in the qualifier, according to NASCAR's qualifying procedure only 43 could race. Each driver ran two laps, with the starting order determined by the competitor's fastest times. Drivers who recorded their lap times early in the session were at an advantage because the track was cooler and thus gave more grip. Edwards felt his car had oversteer during his run. Kyle Busch won the third pole position of his career with a time of 29.613 seconds. He was joined on the grid's front row by Edwards, who was 0.125 seconds slower and had the pole position until Kyle Busch's lap. Martin qualified third, Gordon fourth, and Mike Skinner fifth. Biffle, Scott Riggs, Earnhardt, Kurt Busch, and Sadler completed the top ten qualifiers. The four drivers that failed to qualify were A. J. Allmendinger, Joe Nemechek, John Andretti, and Sauter (who crashed at turn-two on his first qualifying lap). Burney Lamar withdrew from the race prior to qualifying. After the qualifier Busch said his team was aware of the car's potential which was displayed in Friday's sole practice session and the January test session; he was worried about his vehicle being very tight going into the first and second turns having been on the accelerator pedal throughout his fastest lap. On Saturday afternoon, Matt Kenseth was fastest in the second practice session with a time of 30.321 seconds, ahead of Clint Bowyer and Earnhardt. Travis Kvapil was fourth-fastest; David Gilliland was fifth and Biffle sixth. Johnson, Newman, Hornish and Edwards followed in the top ten. Kyle Busch scraped the outside wall while driving up the track; he sustained minor damage and did not switch to a back-up car. Later that day, Kahne paced the final practice session with a time of 30.580 seconds; Edwards was second and Paul Menard third. Gordon was fourth-fastest, ahead of Hendrick Motorsports teammates Johnson and Earnhardt. Reutimann was seventh-fastest, Biffle eighth, Bowyer ninth, and Dave Blaney tenth. Bowyer moved to the outside of the track but was unable to steer left and hit the outside wall leaving turn-two and into the backstretch; he came down the track and Kyle Petty hit Bowyer and damaged his front-left fender before Bowyer's car stopped after he made contact with the inside wall. Bowyer was required to use a back-up car but Petty was able to repair his chassis. Live television coverage of the race began at 3:30 p.m. EST in the United States on Fox. Around the start of the race, weather conditions were sunny, between 54 and 64 °F (12 and 18 °C), and no rain was expected. Gusty winds from the north created strong headwinds on the back straight. Kenny Farmer, chaplain of Las Vegas Motor Speedway, began pre-race ceremonies with an invocation. Actress Carol Linnae Johnson of the stage production Mamma Mia! performed the national anthem, and John Byers, co-director of UAW-Chrysler National Training Center, commanded the drivers to start their engines. During the pace laps, two drivers moved to the rear of the field because of unapproved changes: Bowyer had switched to a back-up car, and Kahne had changed his engine. The race started at 4:48 p.m.; Kyle Busch maintained his pole position advantage heading into the first corner and led the field on the first lap. Carpentier went up the track on the same lap but avoided hitting the barriers, while Reutimann did the same and scraped the outside wall, causing right-rear damage to his car. He was black-flagged by NASCAR because debris was dangling from his vehicle. Reutimann's right-rear tire exploded while entering the pit road on lap five but no debris was left on the track. On lap eight, Bowyer hit the wall, causing Kahne to drive down the track. He also made contact with Jamie McMurray, who slid through the infield frontstretch grass, causing the first caution flag and the appearance of the pace car. During the caution, most drivers elected to make pit stops for tires, and eighteen drivers remained on the track. Kyle Busch stayed out and led the field back up to speed on the lap twelve restart. Four laps later, Edwards started to challenge Kyle Busch for the lead. Jeff Gordon moved up to third on lap 18, and Martin moved from third to eighth by the same lap. Kyle Busch and Edwards ran alongside each other in the battle for the first position on lap 20; the battle concluded after Edwards passed Kyle Busch on the following lap. Gordon was passed by Biffle for third place on lap 22, while Kurt Busch moved up to fifth on the same lap. By lap 28, Biffle had closed the gap to Kyle Busch and passed him for second position two laps later. Edwards had a 1.3-second lead over teammate Biffle on the same lap. Kyle Busch fell to fourth place after Gordon passed him on the 33rd lap. Kyle Busch reclaimed the third position from Gordon two laps later; Kurt Busch had moved into third after moving ahead of Gordon on the same lap. By the 42nd lap, Edwards and teammate Biffle had opened a three-second lead over Kyle Busch. Riggs and Kurt Busch both moved in front of Kyle Busch for third and fourth positions on lap 45. Mark Martin led the field for one lap. Green-flag pit stops began on lap 48. Edwards and Biffle made pit stops on lap 49, handing the lead to Riggs. Hornish hit the turn-two outside wall on the following lap after his right-front tire went down in the tri-oval, and sustained damage to his right-front quarter panel, but no debris came off his car. After the pit stops, Edwards regained the lead and held a five-second lead over Kyle Busch; Martin moved into third place, Riggs regained fourth place, and Harvick moved up to fifth place by lap 65. Three laps later, a second caution was needed when debris was spotted at turn-two. Most of the leaders, including Edwards, made pit stops. Jeff Burton chose to remain on the track and led on the lap-75 restart, ahead of Earnhardt and Kyle Busch. On lap 78, Kyle Busch moved ahead of Earnhardt to take second place and began to close the gap to Burton. Kyle Busch passed Burton to reclaim the lead three laps later, and opened up a 1.3-second advantage over Burton by the 92nd lap. Earnhardt was passed by Edwards for fifth place on lap 94 and Biffle got ahead of Gordon for seventh on the same lap. Edwards gained fourth place when he passed Stewart on the 96th lap, and Burton lost second to Kenseth two laps later. On lap 102, Burton fell to fourth place after Edwards passed him. By lap 105, Kyle Busch held a 3.1-second lead over Kenseth. Three laps later, the third caution was triggered when Stewart's car made heavy contact with the turn-two wall after his right-front tire burst. Stewart grazed his foot and climbed out of his car; emergency workers helped take him to a waiting car that took him to the infield medical center for further examination. All of the race leaders, including Edwards, chose to make pit stops for tires and car adjustments under caution. NASCAR required Edwards to fall back to the end of the longest line because one of his crew members had allowed one of his tires to roll away from his pit box during his stop. Kyle Busch maintained the lead at the restart on lap 114; he was followed by Kenseth and Gordon. Kenseth passed Kyle Busch to take the lead on lap 117. On the same lap, Gordon passed Busch. By lap 135, Kenseth had opened up a 2.2-second lead over Gordon. Biffle moved in front of Burton for fourth place on the 139th lap. On lap 144, Robby Gordon's right-front tire blew, causing him to hit the turn-two wall, and the fourth caution was triggered. All of the race leaders made pit stops during the caution. Kenseth remained the leader at the lap-149 restart; he was followed by Gordon. The fifth caution was deployed twelve laps later when Carpentier was squeezed towards the backstretch outside wall by Newman, causing Carpentier to slide down the track and hit the inside wall. Ken Schrader was close by the incident but swerved to avoid damaging his car. During the caution, the leading drivers, including Kenseth, elected to make pit stops for tires. Gordon took the lead and maintained it at the lap-165 restart. Biffle and his teammate Kenseth drove alongside each other in a battle for second place on lap 166, until Biffle escaped and ran onto the apron on the next lap. Mayfield burst his right-front tire on lap 171, but no debris came off his car, avoiding the need for a caution. Six laps later, Biffle passed Kyle Busch to take fifth place. Riggs experienced oversteer in the fourth turn while running down the inside of Labonte; Franchitti ran into Riggs, causing the sixth caution on lap 179. All of the leaders, including Kenseth, elected to make pit stops for tires. Earnhardt led the field on the lap-183 restart; he was followed by Harvick and Edwards. Gordon moved into fifth place by lap 188. Harvick fell to fourth place when Edwards and Kenseth passed him. Brian Vickers spun around after he was hit by Casey Mears. Edwards passed Earnhardt to reclaim the lead on lap 195, while Earnhardt lost a further position after Kenseth got ahead of him on the same lap. Ten laps later, Biffle moved ahead of Harvick to take fifth place, while his teammate Kenseth had a 1.5-second lead over the second-place Edwards by the 211th lap. Three laps later, the seventh caution was issued when officials located debris in the turn-two groove. The leaders, including Edwards, chose to make pit stops for tires and car adjustments. One tire from Edwards' car went outside his pit box but he was not penalized because a cameraman blocked Edwards' crew from retrieving the tire. Kenseth led the field back up to speed on the lap-219 restart; Earnhardt was in second place and Edwards third. Casey Mears hit Vickers, who spun and triggered the eighth caution on lap 224; both drivers avoided contacting the wall. Kenseth maintained the lead on the lap-227 restart. Edwards drove up the track in an attempt to take the lead on lap 229, but Kenseth kept the position. Four laps later, the ninth caution was needed when Dale Jarrett spun and hit the turn-two outside wall. Kenseth remained the leader at the restart on lap 236. Edwards passed teammate Kenseth for the lead two laps later, and began to pull away. Earnhardt caught up to Kenseth by lap 243 and ten laps later he passed Kenseth for second. Kurt Busch's right-front tire exploded, causing him to hit the wall between turns three and four, and the tenth caution was shown on lap 256. Kurt Busch retired from the race because of his crash. He was transported to the infield medical center for a mandatory check-up. Edwards remained in the lead for the lap-262 restart. Earnhardt spun his tires, forcing Kenseth onto the outside lane and Gordon to the inside where he passed Earnhardt. Kenseth moved in front of Earnhardt and then made contact with Gordon, who was sent into the inside backstretch retaining wall, which had no SAFER barrier installed. Gordon's car's radiator flew out from its chassis and into the path of oncoming traffic. Kenseth slid but was able to straighten his car and continue. The final caution was initially waved before a red-flag was shown, stopping the race to allow officials to remove debris from the track. The race resumed 17 minutes later, with Edwards leading Earnhardt and Biffle. Edwards maintained the lead for the remaining two laps to secure his second consecutive win and the ninth of his career. Earnhardt finished second, ahead of Biffle in third, Harvick fourth, and Burton fifth. Ragan, Kahne, Kvapil, Hamlin, and Martin rounded out the top ten finishers. The race had eleven cautions and nineteen lead changes among nine drivers. Edwards led four times for a total of 86 laps, more than any other competitor. Edwards appeared in Victory Lane in front of the crowd of 153,000 people to celebrate his second victory of the season, earning him $425,675. He was pleased with the result, saying it was "a very special win" and that he felt he was close to the form he had achieved in 2005: "I tried hard to stay calm. And I'm not the best at it sometimes. We all know that." He added, "We do this to win. Winning these races is the greatest. Winning a championship would be the ultimate. What we’re trying to do is win the championship this year. That’s our number-one goal.” Second-place finisher Earnhardt was disappointed, saying he had his car in his chosen position but the red-flag period prevented him from winning the race: "Carl wasn't going to get beat today. He had it in the bag. He was so strong ... I was terrible on cold tires. I wish all of you knew what that felt like. I hate it." Biffle was philosophical as he argued that he had the fastest car but did not gain the track position he needed to challenge Edwards because he slid on pit road. Despite his injury, Stewart said he hoped to participate in a planned two-day test session at Phoenix International Raceway. He also said he was worried about his crash because his legs and hips were tingling and his lower back was in pain. Stewart said the crash scared him and the tingling in his legs had improved after leaving the infield care center. Kurt Busch's crew chief Pat Tryson stated that he and the Penske Racing South team were relieved that the driver emerged uninjured after his crash on lap 256, and that they would do better at the next weekend's race. Gordon said his crash on lap 264 was "probably the hardest hit I've ever taken" and admitted fault for causing the crash. According to Kenseth, "I knew he was going to get a run on me, so I laid back a little bit ... We came off [turn] 2 and I was up as high as I thought I could, and Jeff just came across. Whether it was on purpose or not, it just kind of wiped us out." Gordon said he hoped Speedway Motorsports chairman and chief executive Bruton Smith (the owner of Las Vegas Motor Speedway) would install SAFER barriers along the inside retaining walls around the track. Biffle said there should have been no open gaps in the circuit barriers and that all NASCAR tracks should have SAFER barriers installed. After consulting NASCAR officials, construction crews installed a 1,700-foot (520 m) long SAFER barrier along the inside backstretch wall in August 2008. After the race, NASCAR announced it had found a problem with the lid on the oil reservoir encasement during a post-race inspection on Edwards' car, which was later taken to the NASCAR Research and Development Center in Concord, North Carolina, for further analysis. Three days after the race, Roush Fenway Racing was given penalties for "actions detrimental to stock car racing", "car, car parts, components and/or equipment used do not conform to NASCAR rules", and a device or duct work that permitted air to pass through the car from one area of the interior of the car to another, or to the outside of the car. The penalties included a $100,000 fine and a six-race suspension for Edwards' crew chief Bob Osborne, who was suspended from NASCAR until April 30, 2008, and placed on probation until December 31, 2008. Roush Fenway Racing chief engineer Chris Andrews took over Osborne's role at the next race weekend. Edwards and car owner Jack Roush incurred the loss of 100 driver and owner points. In the event that Edwards qualified for the Chase for the Sprint Cup, he would not receive ten bonus points awarded to him for winning the race which was used to determine the seeding order. Edwards was allowed to keep the victory; he moved from first to seventh in the Drivers' Championship. On March 12, Roush Fenway Racing announced it would not appeal the penalties. Roush Fenway Racing president Geoff Smith said a bolt that held the oil lid together did not work because of vibration harmonics generated by Edwards' car and the Las Vegas race track. Edwards said the infraction was "an absolute mistake" and that his team had no intention of cheating. Edwards' teammate Biffle and Newman agreed the penalties were justified. According to Sadler, the penalties were not severe enough; he argued that the driver should be penalized or required to miss one event. Toyota Racing Development General Manager Lee White said Roush Fenway Racing had modified Edwards' car to enhance downforce by 240 lb (110 kg), which increased the car's horsepower leaving the corners. Roush felt White's comments were motivated by results. White later issued a statement in which he apologized for his comments. An internal investigation found no evidence that another person had intentionally caused the bolt to come loose, and that the team enacted protective measures to ensure the oil lid would stay fastened in future events. 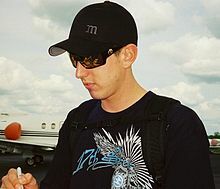 The result meant Kyle Busch maintained his lead in the Drivers' Championship, twenty points ahead of Newman in second place. Kahne's seventh-place finish allowed him to advance into third place, sixteen points in front of Harvick, who also moved up three positions. Biffle was in fifth on 427 points. Burton, Edwards, Truex, Sadler, Earnhardt, Stewart and Kurt Busch rounded out the top twelve. Ford moved into the lead of the Manufacturers' Championship, five points ahead of Dodge. Chevrolet moved three points clear of Toyota. The event had a television audience of 12.1 million viewers; it took three hours, eight minutes, and eight seconds to complete the race, and the margin of victory was 0.504 seconds. Ryan Newman (pictured in 2009) maintained second position in the Drivers' Championship. ^ a b c d e f g h i j k l m n o "The Race: UAW-Dodge 400". Jayski's Silly Season Site. ESPN Internet Ventures. Archived from the original on May 16, 2008. Retrieved December 13, 2015. ^ a b c d e f g "2008 UAW-Dodge 400". Racing-Reference. USA Today Sports Media Group. Archived from the original on June 15, 2016. Retrieved December 13, 2015. ^ "Weather History for Las Vegas, NV". Old Farmer's Almanac. Yankee Publishing. Archived from the original on December 19, 2015. Retrieved December 15, 2015. ^ "Tracks". NASCAR. Turner Sports Interactive. Archived from the original on February 7, 2011. Retrieved March 3, 2011. ^ ESPN SportsTravel (June 20, 2011). "Las Vegas Motor Speedway". ESPN. Archived from the original on December 19, 2015. Retrieved December 13, 2015. ^ "2008 Official Driver Standings: Auto Club 500". NASCAR. Turner Sports Interactive. Archived from the original on January 29, 2009. Retrieved December 13, 2015. ^ "Las Vegas Motor Speedway NASCAR Cup winners". Las Vegas Review-Journal. News + Media Capital Group. March 8, 2015. Archived from the original on March 15, 2015. Retrieved March 26, 2016. ^ "2008 Sprint Cup Testing News Las Vegas Motor Speedway, Jan. 28-29, 2008". Jayski's Silly Season Site. ESPN Internet Ventures. Archived from the original on May 11, 2008. Retrieved December 20, 2015. ^ "Roush Fenway Racing Advance" (PDF). Roush Fenway Racing. Archived from the original (PDF) on November 28, 2010. Retrieved July 19, 2016. ^ "Johnson favored to win his fourth straight Vegas race". Las Vegas Review-Journal. News + Media Capital Group. February 29, 2008. Archived from the original on July 19, 2016. Retrieved July 19, 2016. ^ "Jimmie Johnson shooting for fourth straight Vegas win". Hendrick Motorsports. February 26, 2008. Archived from the original on July 19, 2016. Retrieved July 19, 2016. ^ "Wood Bros hire Sauter for Vegas". crash.net. February 28, 2008. Archived from the original on December 19, 2015. Retrieved December 13, 2015. ^ "A challenge and an opportunity". Milwaukee Journal Sentinel. Gannett Company. February 27, 2008. Archived from the original on August 31, 2016. Retrieved December 14, 2015. ^ a b Blount, Terry (March 2, 2008). "Kahne fights cold by posting fastest Happy Hour lap". ESPN. Archived from the original on April 24, 2016. Retrieved April 24, 2016. ^ "Las Vegas: Practice 1 times". motorsport.com. February 29, 2008. Archived from the original on December 19, 2015. Retrieved December 19, 2015. ^ "Entry List". Motor Racing Network. International Speedway Corporation. Archived from the original on December 19, 2015. Retrieved December 13, 2015. ^ Meija, Diego (March 1, 2008). "Kyle Busch takes pole at Las Vegas". Autosport. Haymarket Publications. Archived from the original on March 6, 2008. Retrieved July 19, 2016. ^ a b Sporting News Wire Service (February 29, 2008). "Kyle Busch continues to ride wave with Vegas pole". NASCAR. Turner Sports Interactive. Archived from the original on May 16, 2008. Retrieved December 13, 2015. ^ Coble, Don (March 1, 2008). "Kyle Busch nabs pole". Amarillo Globe-News. Morris Communications. Archived from the original on December 19, 2015. Retrieved December 13, 2015. ^ "Practice Two Speeds". NASCAR. Turner Sports Interactive. Archived from the original on February 25, 2009. Retrieved December 13, 2015. ^ a b Menzer, Joe (March 2, 2008). "Final practice shows high line the fastest and riskiest". NASCAR. Turner Sports Interactive, Inc. p. 1. Archived from the original on July 6, 2008. Retrieved December 13, 2015. ^ "Practice Three Speeds". NASCAR. Turner Sports Interactive. Archived from the original on February 25, 2009. Retrieved December 13, 2015. ^ a b c d e f g h i j k l m n o p q r s t u v "Lap-by-Lap: Las Vegas". NASCAR. Turner Sports Interactive. March 3, 2008. Archived from the original on September 5, 2008. Retrieved December 13, 2015. ^ a b Peltz, Jim (March 3, 2008). "Edwards makes it two wins in a row". Los Angeles Times. Tribune Publishing. Archived from the original on December 3, 2015. Retrieved December 14, 2015. ^ "Tire Woes Force Hornish Jr. and Team to 41st Place Finish in Las Vegas". Team Penske. March 3, 2008. Archived from the original on April 24, 2016. Retrieved April 24, 2016. ^ a b Fryer, Jenna (March 2, 2008). "Edwards Wins Vegas to Make It 2 Straight". The Washington Post. Nash Holdings. p. 2. Retrieved December 14, 2015. ^ "Las Vegas: Ken Schrader race report". motorsport.com. March 4, 2008. Archived from the original on August 17, 2016. Retrieved August 17, 2016. ^ a b "Kurt Busch Relegated To 38th-Place Finish After Late-Race Crash At Vegas". Team Penske. March 3, 2008. Archived from the original on August 17, 2016. Retrieved August 17, 2016. ^ a b Blount, Terry (March 2, 2008). "Shortcoming in postrace inspection could cost Edwards points lead". ESPN. Archived from the original on December 19, 2015. Retrieved December 14, 2015. ^ Fryer, Jenna (March 3, 2008). "Edwards supplies NASCAR encore". The Seattle Times. Archived from the original on December 19, 2015. Retrieved December 19, 2015. ^ Graves, Gary (March 3, 2008). "Edwards antes up at Vegas for second straight win". USA Today. Gannett Company. Archived from the original on December 19, 2015. Retrieved December 14, 2015. ^ a b Caraviello, David (March 3, 2008). "Crash has Gordon wanting safety upgrades at LVMS". NASCAR. Turner Sports Interactive. Archived from the original on July 18, 2008. Retrieved December 14, 2015. ^ Margolis, Bob (March 2, 2008). "UAW‑Dodge 400 Observations". Yahoo! Sports. Archived from the original on December 19, 2015. Retrieved December 14, 2015. ^ "Gordon's crash in spring prompts Vegas to put in SAFER barrier". ESPN. Associated Press. August 27, 2008. Archived from the original on December 19, 2015. Retrieved December 14, 2015. ^ "Edwards Doubles Down In Vegas". Motor Racing Network. International Speedway Corporation. March 2, 2008. Archived from the original on December 19, 2015. Retrieved December 14, 2015. ^ a b Courchense, Shawn (March 5, 2008). "Carl Edwards And The No. 99 Team Slapped By NASCAR After Las Vegas Win". Hartford Courant. Tribune Publishing. Archived from the original on December 19, 2015. Retrieved December 19, 2015. ^ a b c Mejia, Diego (March 6, 2008). "Edwards penalised, loses points lead". Autosport. Haymarket Publications. Archived from the original on March 8, 2008. Retrieved December 19, 2015. ^ Caldwell, Dave (March 6, 2008). "Car's Failed Inspection Costs Edwards Points". The New York Times. Retrieved December 14, 2015. ^ White, Ronnie (March 12, 2008). "Roush won't appeal Edwards' penalty for failing Las Vegas inspection". The Birmingham News. Advance Publications. Archived from the original on November 20, 2012. Retrieved December 19, 2015. ^ a b Pate, Josh (March 7, 2008). "Roush fires off at critics, denies intent of cheating". NASCAR. Turner Sports Interactive. Archived from the original on May 17, 2008. Retrieved December 19, 2015. ^ a b c d Ryan, Nate (March 8, 2008). "Earnhardt, other drivers weigh in on Roush Fenway's denial". USA Today. Gannett Company. Archived from the original on December 19, 2015. Retrieved December 19, 2015. ^ "Edwards will not appeal". Spartanburg Herald-Journal. 163 (73). New Media Investment Group. Associated Press. March 13, 2008. p. C4. Retrieved July 19, 2016. ^ a b "2008 Official Driver Standings: UAW-Dodge 400". NASCAR. Turner Sports Interactive. Archived from the original on December 8, 2008. Retrieved December 14, 2015. ^ "Race Lineup". NASCAR. Turner Sports Interactive. Archived from the original on May 9, 2008. Retrieved December 14, 2015.